Wrightstyle, the international supplier of steel and aluminium glazing systems. Curtain wall & roof glazing systems by Wrightstyle. We are unique in being the only global provider, of complete and guaranteed high performance steel and glass façade systems, offering total solutions for complex architectural designs. Fixed – supply of fully fabraicated product to site and installation by qualified installers of Wrightstyle systems. With the Wrightstyle 50 & 60 series, multiple configurations of doors, screens & windows can be produced. Our range of glazing systems provides an unlimited number of fenestration options. Utilising a wide range of high quality steel and stainless steel profile shapes provides countless possibilities. Wrightstyle’s vast range of profiles form an integral part of Wrightstyle’s total glazing system solutions. In addition to the 50 & 60 series glazing systems, the Wrightstyle 6050F1 series offers a range of profiles for the integrity and insulation requirement. Providing an unlimited number of fenestration options in fire resistant glazing. Developed specifically for fire insulated applications, the 6050F1 series system is constructed using a unique heat absorbing infill, which is contained completely within the profile. Using 6050F1 simplifies fabrication and ensures that the profile strength is maintained. Sharp design features ensure clean internal lines. This is accomplished with hidden fixings and snap over glazing beads in a variety of sizes. A unique feature that accommodates most glass thickness’, using either glazing gaskets or tape. The Products: doors, screens, windows, curtain walling & roof glazing, fire resistant to 2 hours integrity or integrity & insulation, fire resistant glass, blast resistant to car and lorry bomb protection levels, bullet resistant options, large span un-supported curtain walling & roof glazing, stainless steel options. 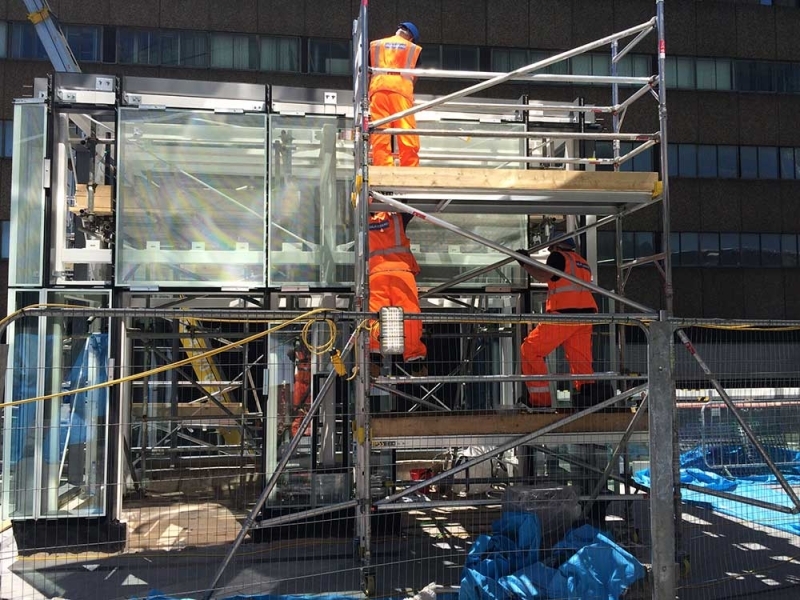 Wrightstyle Ltd design test and supply a wide range of specialist architectural glass, to compliment their steel and stainless steel glazing systems. Our involvement in the architectural systems market is extensive, with global knowledge in the specification, testing, development and supply of glass products, which are designed to be used in association with our glazing systems. These glass products are available through our network of international licensed fabricators, giving architects and end users the advantage of quality assured local installation. Definitions – there are two distinct types of fire resistant glass. Integrity Only prevents the passage of fire through an assembly for a given time period. Depending on the application and required specification this can be for 30 minutes or 60 minutes. Our range of Integrity Only glasses to meet this requirement is WSL G-Glass. Integrity and Insulation, not only stops the fire but also radiant heat, to protect escape routes and building boundaries from the spread of fire. This type of glass is also available to cope with a range of time spans i.e. 30 minutes, 60 minutes, 90 minutes and 120 minutes. Our range of Integrity and Insulation glasses to meet this requirement is WSL F-Glass. For specification data sheets, including range of glass sizes suitable for each type of specification can be found by using the navigation menu on the left of the screen. We offer a comprehensive site installation service, using qualified installers who have been trained in-house and certified by Wrightstyle and are therefore fully conversant with our product range. Using our installation service delivers the complete solution, combined with unsurpassed technical support throughout. Wrightstyle believe system training for installation work is not only fundamental, but essential. Stringent health and safety procedures are combined with strict quality control systems. All projects have a specified Wrightstyle project manager, giving the customer clear lines of communication direct with our company. This gives subcontractors, contractors and specifiers, the option for single sourcing a steel glazing contract; often for complex design applications to just one company – negating the need for ordering from multiple supply chains, and then using further sub-contractors to fabricate and install the finished systems. The obvious benefit is that you will be dealing with the company that provided the designers and fabricators of the glazing system being installed. How refreshing to deal with the people who know their product from conception to completion, without having to go through a third party. Total clarity for your steel glazing project: from design, through fabrication, to professional installation.